The Fog Island Tavern ‘Quarrgument’ Symposium, third and final night. The Fog Island Tavern ‘Quarrgument’ Symposium, third and (so far) final night. – Ah, there you are, guys. I was afraid you were going to chicken out on the last part of our symposium. – Why, Vodçek, is there any other place on the island to go to for a bit of lubricated conversation? We were just delayed watching our friend trying to run his boat into the harbor — he got a new fancy radar system, and apparently was so busy watching it going into the channel that he ran aground on the sandbank at the third pole. – Huh? That’s a course he’s been doing for fifty years now, he could do it blindfolded in a moonless pea-soup-fog night? – Just goes to show. Maybe the radar was made in one of those countries we slapped the new tariffs on? – Don’t be silly. Even I know the radar doesn’t show stuff under water. He just got distractified with the new gizmo, is all. – You’re right, Renfroe. Hope the boat is okay. Anyway, are we going to try for the last part of Abbé Boulah’s agenda? – I won’t even bother to ignore that remark, Bog-hubert. Okay then: The idea was to see whether and how our buddy’s proposed Planning Discourse Platform meets the expectations we drew up last night. Bog-Hubert — I believe you are the most familiar guy here, with that proposal — where should we start? You want to give us a rundown on its basic features? – Hmm. I thought we’d go by the list we set up last night, maybe in a slightly different order. Haven’t we all have heard enough about the basic idea to fit things into the overall scheme? If there are questions, I can always fill in more detail. Keep in mind that this ‘platform’ is meant to facilitate planning or policy-making discourse about issues or problems that cut across the borders of established jurisdictions — municipalities, counties, states, nations. Even more so for global crises and challenges. Problems of the ‘wicked’ kind, where it is not clear who is affected by either the problem or by proposed solutions, where ‘voting’ decision-making practices aren’t applicable because there are no clear boundaries that define who’s eligible to vote, so decisions will have to be based on some other measure, like the merit of the information provided in the discourse. Much of which is not known already, stored in textbooks and data bases, but will mainly be established precisely by means of discourse contributions: the folks concerned talking about what should be done. So the first question probably should be how to get at all that information. – That’s the question we put up in that list last night as “Inviting, even offer incentives to voice ALL concerns”, isn’t it? – So what does the proposal say about that? – Several steps.The assumption is that there will be some organization providing that platform, an online website for discussing plans and policies. Which remains to be determined, by the way. It first puts up issues, projects or problems that somebody feels should be dealt with by some collective response, on a kind of ‘bulletin board’, where people can indicate whether it should become a project discussion. – Makes sense: first people have to become aware of what needs to be discussed and acted upon. The kind and number of responses will determine whether it will be taken up, I assume? – Yes. For projects that receive a sufficient number of replies indicating the need for public discussion, a kind of website will be set up, that invites everybody who has a concern or pertinent information to send in messages expressing that concern. So it’s open for any input, to respond to part of the question. To offer incentives to do so, the proposal is suggesting to reward every entry with some basic ‘contribution credit points’ — provided that the content of the entry is pertinent to the project and hasn’t already been made. No repetition. But all entries will be stored for reference. – This already brings up the problem of moderation — keeping the discourse ‘civil’: the issues of ensuring “General ‘netiquette’ ” and responding to violations. General ‘netiquette’ also applied to decision-making discourse: How is that being dealt with? – That question is dealt with in several ways, Sophie. There is a ‘standard’ set of ‘procedural agreements’ covering the entire platform — expressed mostly as desirable ‘do’, more than ‘don’t do’ recommendations. All comments are accepted into that unconstrained ‘verbatim’ file, as written. But to be entered into the concise overview and assessment displays and worksheets, the ‘core content’ will be translated into the basic question, claim and argument format that omits qualification, repetition, characterization and anything that isn’t connected to the subject being discussed in a distinct ‘if-then’ or similar relationship. – How is that translation into the condensed format done? – Good question. Ideally, participants should do that themselves, but that’s something traditional education hasn’t taught us yet. So initially, in small projects, this may have to be done by trained support staff. – Couldn’t the AI folks write algorithms for that? Dexter? – Down the road, perhaps, Vodçek. Once they see if they can make money on it? Meanwhile, there could be templates for expressing arguments, for example, — the ‘planning argument’ forms we have identified as key to the planning discourse haven’t been acknowledged by the traditional literature of argumentation yet nor gotten into the textbooks. So those templates would serve to familiarize participants with the approach. – No suggestions on ‘consequences’ for violating the basic rules — of decency, truthfulness, personal attacks, etc.? The ‘Response to violations’ item on our list? – One kind of response for that would be through the provisions for contribution credits. Remember the incentive points given to all entries — basic acknowledgements for contributions, at first. Set up to build a kind of ‘civic merit’ account for people, that could be valuable for other things, say like qualification for office or jobs. Those points might be adjusted up or down by the community, depending on their plausibility, they way they are backed up by reliable evidence, an so on. If there is a formal evaluation of contribution items, e.g. arguments, the resulting evaluation scores will be used to do that adjustment up or down in a systematic manner. Otherwise, the community could just enter adjustment judgments. – You think that might be effective as a preventive strategy, to keep trolls and fake truth posters from entering garbage? – Okay: it looks like that issue is part of the proposal, with room for different expansion ideas, including ‘Evolution of self-governance for responses to violation’ for keeping the discourse constructive. What about the issue of balancing the parliamentary principle of free speech and getting all concerns, but linking them more effectively with the decisions? The goal of getting Decisions based on merit of all contributions? – This is the part that’s addressed in the ‘special techniques’ appendix of the PDSS paper, offering several techniques both older and new, innovative, for the goal of developing some performance measure based on the merit of discourse contributions, that can guide decisions. It contains the whole set of provisions for evaluation that we decided last night to put on the list for more research and development. But the entire proposal is aimed at making such techniques part of the process.They all aim at ‘Ensuring ‘due consideration’ of all concerns’ — nudging participants to address all aspects, all pros and cons in their assessment and judgments. Encouraging Emphasis on evidence, support for claims that receive opposing judgments from different parties. And displaying arguments with all ‘premises’ explicitly identified for assessment — including the ones that are often left unstated as ‘taken for granted’ but also need scrutiny and evaluation. – Not sure what you are asking, Dexter — details of the evaluation? Or the ‘unstated premises’? – Well, actually both. But thinking about it now, I think I understand the one about the premises taken for granted. It’s about the ones we often sluff off saying things like ‘all else being equal’, if at all? – Yes, our planning arguments — the pattern, “Yes, we ought to do A [conclusion, proposal] because A will result in B, given conditions C [the factual-instrumental premise] and we ought to pursue B [deontic or ought-premise] and conditions C are present (or will be when we do A) [factual premise]” are almost never completely stated like that — we use any two of those, ‘taking the third ‘for granted’ as needing no further discussion, and people mostly understand the argument. But to assess the plausibility of the whole argument, all three premises need to be evaluated. Was that the other part of your question? – Yes. And your explanation cleared that up as well, thanks. It’s a bit unusual, though? – Just at first sight; it’s really the conceptual framework for organizing the discussion based on everyday talk — identifying topics, issues, answers and arguments with their component parts — and for displaying the overall picture of the evolving discourse in maps and model diagrams. The Displays of essential ‘core’ content. And explicitly Separating claims and evaluation. But then, that basis serves to prepare the material for more systematic evaluation: the assessment of argument premise plausibility, the weighing of goals and objectives, together forming a measure of argument weight, and all the argument weights forming a measure of proposal plausibility. – I get it, all the plausibility scores and weights of the pros and cons tilting the overall proposal plausibility scale towards approval or rejection? – Wait. Yes, I get that, too, Renfroe. But Bog-Hubert: Just making sure I understand: Are you saying that the decision should be determined by such a plausibility measure? – No, Vodçek. The proposal warns explicitly against that kind of shortcut. ‘Guiding decisions’ is seen more as using the plausibility assessments by different parties as indications for how a proposal might be improved to lessen the concerns of some participants and improve their evaluation scores. ‘Back to the Drawing Board’ — but now with more specific hints about what aspects need revision, better ideas, more creativity, perhaps even compromises. And even if the final decision is done by vote — according to traditional practices or constitutional rules — to make it less likely that decisions to approve a plan go in the face of very negative assessment results, — or vice versa. Preventing decisions that would ignore significant concerns of the voting minority. – You keep talking about measures based on plausibility — of proposals, and argument premises. Is that the same as what we might call the quality or goodness of a plan? We didn’t talk about that yesterday, so it isn’t on the list — but isn’t that important? – Good question, Sophie. Of course, some of the comments and arguments — pros, cons, benefits, costs, may aim at what you are after with the term ‘quality’ or ‘goodness’. But it is also possible to use an evaluation technique that focuses more explicitly on ‘goodness’ — and to combine that with the ‘plausibility’ assessment, if the discussion hasn’t covered that sufficiently well. Again, room and opportunity for creative evolution. – Yes: I remember, we talked about this too: part of this vision of participatory community planning is the insight that the process must allow participants to not only engage in the creative cooperation towards the solutions, the outcomes, the visions of the activity, but to also shape the process of getting there — as ‘their’ creation, as part of the overall solution? – Right. The process and platform must remain open to adaptation, refinement, innovation. – Getting back to our list for a moment, Bog-Hubert: we talked about the procedural agreements that will be needed, and how that could be a problem. How does the proposal deal with that? – It has several levels of provisions. There are some overall ‘standard’ netiquette-like agreements, that you are assumed to agree to by engaging in a discourse. Like most such rules we are used to, even if few people actually read them before signing. That allows the organization to do the basic moderating, and even to kick you out if you break them in a serious way. Nothing radically new there. Then when a new project is set up, the question will be raised whether the circumstances for that project will call for more specific agreements; those may have to be briefly discussed, and added to the general ‘rules’. Third, when the participants in a project discussion decide to use one of the ‘special techniques’, the vocabulary and assumptions for that technique may have to be explained and agreed upon. Finally, the procedure of the discourse has a Next Step? ‘phase’. That’s where the group decides whether it is ready for a decision, or needs more discussion, or the input from a special technique team etc. And there, participants can suggest to make changes in the initial agreements, if the discussion brings up conditions that make this necessary. – Okay. Its a bit complex, but flexible — lets people get started by accepting some basic agreements, but change them if really necessary. Puts a few safety nets into that bottomless pit nightmare we conjured up last night. – So the more people get involved in this kind of approach, the less of a problem it will be, don’t you think? The less need for cumbersome discussions about the rules that distract and hold up the real project discussion? – Yes, I think so. The alternative would be the last point in that list: Training for proper discourse participation. These procedures and agreements should ideally be part of everybody’s education. – So what do you do until that is achieved? If ever? Can we wait to use such tools until everybody knows the rules? – Of course not, Vodçek. There will be a need for training courses, manuals, familiarization exercises to get people ready for effective participation. So the development of those things will have to be priority preparation tasks for the implementation of the concept. – I remember some papers about that, where the suggestion was to develop online games, for kids and others who want to familiarize themselves with the idea to ‘play’ — online, on their computers, tablets, cellphones. With these tools becoming more and more common all over the world even among poor people, the process of getting folks familiar with the tool would be much faster than waiting for all the world’s school systems to add this to their curricula, training teachers and developing textbooks to be approved by the school boards and government education departments, eh? – Sounds good, Dexter — the development of such games would actually be the stepping stones, the prototype and test versions of the eventual programming package for the platform. Might be a job for you to program that? – Hey folks. This interesting speculation is straying far beyond our initial agenda. If we want to continue this, would it be prudent to spend some time on setting up an extended agenda, before we get lost in all the details of actual implementation and variations of the outcome? – Definitely, Vodçek. But I think it would be useful to take a moment to consider what, if anything, we have learned from this little experiment. We jumped ahead at least once to skip some details of our initial agenda: can we say that we achieved what we set out to do? – Well, looking at the initial question — dialogue versus argumentation — I think our decision that it was an inadequate question, a ‘wrong problem’, was appropriate. The distinction between ‘argument’, argumentative discourse and ‘quarrguments’ took the wind out of the sail of the opposition to argumentation, didn’t it? While we found that even in discourse that is not aiming at decisions, questions that generate arguments will occur, there is also nothing in the vision of the planning and policy-making discourse that excludes or discourages the ingredients that were used to justify ‘dialogue’ from also be part of a constructive planning discourse. Did that meet the intent of the first night’s agenda? – There will always be people who will disagree and insist of different interpretations of terms and concepts, theories. But it may be enough — was enough last night — to clear the way out of the endless disagreement about the meaning of words, to proceed with the next agenda item, to set up some specific goals or expectations for a meaningful planning discourse. What can we say about that one? – Impatient wench, Sophie. Yes, I think we made some good inroads on that one too — but do you agree that there are many more considerations we might have identified, with more time and thought? Even some very important ones? – Well, can you think about a major issue we have missed, Professor? – Oh, there are several conundrums that are part of a wider discourse, beyond the initial dialogue – argument issue, that we should keep in mind. There is, for example, the fundamentally different perspective of approaches like Alexander’s Pattern Language. The Discourse perspective can be described as one of generating solution proposals from the examination of information we gather about a problem or ‘situation’, and then examine proposals for their merit, all via discourse, discussion, exchange of information, evaluation. But the Pattern Language suggests, in essence, that solutions should be ‘generated’ from patterns that in themselves embody truth and validity, the ‘quality without a name” — so that the outcome will also have that quality and does not need any more evaluation. How would a discourse deal with proposals and proponents based on such different fundamental principles? – On the list with it! Now that you mention such issues that go beyond our little agenda: Is the distinction between plans and policies that should be developed in such discourse, and actions in response to emergencies, that can’t wait for the outcome of a lengthy public discourse a significant problem? The traditional arrangement for this is the appointment or election (or acceptance of pretenders) of leaders, empowered to make such decisions on behalf of the community. We know this generates the problem of how to control power, control being needed because power is addictive and fraught with temptations to abuse: How does this question relate to the design of the discourse and its provisions? – Good points; yes, there may be more such issues that should be discussed and given ‘due consideration’. The existence of such issues itself makes the case for the development of a better platform for in-depth discourse, doesn’t it? – Which brings us to the third agenda item: How well does the PDSS proposal meet the expectations and requirements we were able to list — and the ones we just added? What do you think, Sophie? – Oh, I’d say that I was somewhat surprised at how many of those aspects were a least acknowledged and addressed in the provisions of the proposal. How well they will actually work, I can’t possibly tell. It will take experiments and the experience and outcome of actual application to judge that, don’t you agree? I’m not an expert on these things, but I haven’t heard about anything else I’d recognize as ‘better ideas’ yet. We should probably investigate that, but keep working on this concept. I think that work on the development of implementation plans, on the missing programming, on the development of teaching materials or games to familiarize people with this approach is urgently needed. Needed resources, funding? Who will run such platforms? Looks like there’s work to do? – Your are right, But not tonight, Sophie. Last call. – Ominous phrase, Vodçek, at the end of such a discussion. – Ominous abominous. It could drive a fellow to drink? Sophie? Still just apple juice? Some problems with the systematic assessment of planning arguments. (Ref. e.g. the article ‘The Structure and Evaluation of Planning Arguments’ (Informal Logic, Dec. 2010, also slightly revised, in Academia.edu). In an effort to explore phenomena, identifying shortcomings and errors, that can be seen as arguments against the too ready acceptance of the argumentative model of planning, I ran into a well-intentioned article full of claims and arguments that did not fit the simple clean basic model of the planning argument, and would cause some problems in their analysis and plausibility assessment. Briefly, there are three aspects of concern. The first is the liberal use of verbs denoting the relationship between concepts that — in the basic planning argument — would be seen as plan features that cause outcomes or consequences. Reminder: the argumentative view shares the focus on cause-effect relationships with much of the systems modeling perspective: the ‘loops’ of systems networks are generated by changes in components / variables causing positive or negative changes in other variables. So the relationship constituting the ‘factual-instrumental’ premise of planning arguments is mostly seen as a cause-effect relationship. This wealth of relationship descriptions is apt to throw the blind faith promoter of the simple planning argument pattern into serious self-recrimination: What is the point of thorough analysis of these kinds of argument, if they never appear in their pristine form in actual discourse? (The basic ‘standard planning argument’ pattern is the following: “Proposed plan X ought to be adopted because X will produce consequence Y given conditions C), and consequence Y ought to be pursued, (and conditions C are or will be given. )” True, it was always pointed out that there were other kinds of relationships than ‘will produce’; or ’causes’, at work in that basic pattern: ‘part-whole’, for example, or ‘association’, ‘acting as catalyst’, ‘being identical’ or synonymous with’, for example. But those were never seen as serious obstacles to their evaluation by the proposed process of argument assessment, as the above examples appear to be. How can they be evaluated with the same blunt tool as the arguments with plain cause-effect premises? Secondly, the problems they cause for assessment are exacerbated by the fact that often, these verbs are qualified with expressions like ‘probably’; ‘likely to’, ‘may be seen as’ and other means of retreating from complete certainty regarding the underlying claims. The effect of these qualification moves is that the entire claim ‘probably x’ or ‘x is likely to advance y’ can now be evaluated as a fully plausible claim, and given a pl-value of +1 (‘completely plausible, virtually certain’) by a listener — since the premise obviously, honestly, does not claim complete certainty. This obscures the actual underlying suggestion that ‘x (actually) will advance y’ is far from completely plausible, and thus will lend more plausibility and weight to the argument of which it is a premise. A third problem is that, upon closer inspection, many of the relationship claims are not just honest, innocent expressions of factual or functional relationships between real entities or forces. They are often themselves ‘laden’ with deontic content — subjective expressions of ‘good’ or ‘bad’: ‘x threatens y’, or ‘relativizes’, or ‘manipulates’ are valuing relationship descriptions: judgments about ‘ought-aspects that the proposed method reserved for the clearly deontic premises of planning arguments: the purported outcomes or consequences of plans. Apart from the option of giving up on the entire enterprise and leaving the subjective judgments by discourse participants unexamined, one response would be to devise ways of ‘separating’ the qualifying terms from the basic claims in the evaluation work sheets given to participants. They would be asked to assess the probability or plausibility of the basic premise claim, perhaps using the qualifying statements as a ‘guide’ to their plausibility judgment (like any other supporting evidence). This seems possible with some additional refinement and simplification of the proposed process. It is less clear how the value-contamination of relationship descriptors could be dealt with. Changing the representation of arguments to the condensed form of the basic ‘standard planning argument’ pattern is already a controversial suggestion requiring considerable ‘intelligent’ assessment of arguments’ ‘core’ from their ‘verbatim’ version, both to get it ‘right’ and to avoid turning it into a partisan interpretation. The ‘intelligent computation’ needed to add the suggested separation of value from relationship terms to the already severely manipulated argument representation will require some more research — but doing that may be asking too much? Sjutusensjuhundreochsytti-sju jäklar, beim heiligen Kyrill von Drögenpütt! – Bog-Hubert, you’ve got to quit drinking that Slovenian stuff, it makes you cuss in incomprehensible Balkan dialects. I can’t even tell whether I should kick you out of here for inappropriate language. – Ah, Vodçek, pour me another one. It’s actually some kind of Swedish and German this time. I think. – Cross-cultural cussing, oh my. What in the world gets you so upset? Anything in your notebook that would have made you rich if you’d thought of it a week ago? – Huh? You’re confusifying me. No, it’s Abbé Boulah. – Good grief. What’s he done now? – It’s not what he’s done but what he hasn’t. – Well, aren’t we all guilty of some of that sin. I should have paid my utility bill several days ago. But explain. – Well, you know how he and his buddy have been working on this scheme for a planning discourse support system. On the basis of the old Argumentative Model of Planning, you remember? – Do I remember? Your ramblings about that one have kept me up beyond too many last calls I care to count. But isn’t it actually a good idea, basically? What’s wrong with it now? – Well, we are all still working on straightening out some details. But Abbé Boulah and his buddy won’t get moving on those problems. I don’t know whether it’s because they don’t think they are serious enough to fix, or because they don’t know how. – It’s this misunderstanding that some people have about the argumentative model — that it’s ‘too rational’ and doesn’t allow for feelings and emotions. So in a few of the first application experiments, the people didn’t even get started on working with it. Well, Abbé Boulah and his buddy are insisting that the model allows for any subject and concern to be brought up in the discussion — as Rittel said, anything can be dealt with as questions and arguments and answers, it’s the most general framework anybody has come up with. So they won’t change anything about the basic concept. – And you think that those critics are right? That the argumentative model does not — how do they put it — accommodate feelings and emotions? – They are right! Some people are just put off or intimidated by the pretense of logic and rationality of the term ‘argumentative model’, and ignores emotions. – Huh, Sophie, good morning. You’ve got a point there. I don’t care whether they are right or wrong. The fact that they are put off by what they think it is when they hear ‘argumentative model’ is the problem. It’s real. So I think that needs to be dealt with, somehow. – I agree. But what do you think they should do? Let’s assume those folks are right. That feelings and emotions should play some significant role in planning discussions. Why do they think that? – Some people are mentioning recent research that seems to show that when people make decisions, the regions in the brain that deal with emotions are showing significant activity some time — they are talking about fractions of seconds — before the thinking and reasoning areas of the brain are signaling that a decision has been made. So they conclude that the emotional side has actually made the decision before the thinking part has, or processed the reasons for it. – Hmm. So what are they saying: because the emotions are calling the shots, the decision is better than what the reasoning part would have come up with? – Wait: isn’t there some good explanation for that? That there may be some piece of information about the situation that the brain has picked up only in the subconscious — some rustling in the forest that the ears have barely registered — but the conscious brain hasn’t yet interpreted and processed yet? But the unconscious has produced the gut feeling that there may be a dangerous predator sneaking up on you? That seems like a very good reason to pay attention to that gut feeling, don’t you think? – Yes: So why don’t you care about that? – Sophie, I do care about those feelings. I have gone by my gut feelings many times myself. And it often turned out that they were right — that there actually was a piece of information that called for attention and influenced the decision. But hey, there were also many times when there wasn’t anything to be concerned about. So often that people around me began to think I was overly paranoid. The issue is: how do I know when the gut feeing is right and when it’s not? – So that’s another reason to care about it, isn’t it? – Sure. But does that whole issue apply to the problem of planning discourse about public issues? Even if it’s just you and me discussing a plan. My gut feeling says do A, but your gut tells you something else — what should we do about that? – I see what you are saying. Unless your gut also tells you to hit me over the head – yeah, yeah, for my own protection or good — we need to talk about it. – Right. It has to be brought out in the discussion. It’s not enough to say ‘my gut tells me to do, or not to do this’ — when there are different gut feeling signals, they need to be made explicit and explored, discussed. And for large public issues, there is even a legitimate question, in Abbé Boulah’s opinion, whether individual people’s feelings should play a role in the decisions. Not that he says that they shouldn’t be voiced if participants in the discussion feel they are important — but merely private, individual feelings without explanation should not be allowed to determine decisions that affect many people over a long time. – You don’t agree with that? – I think there is a case to be made that people who insist that feelings should play a role even in decisions about large scale plans, should offer some evidence that their feelings are shared by a significant number of other people. But in principle: aren’t plans and planning discussions meant to produce solutions that people agree with? That they like, and feel good about? Future situations of their lives that they expect will be emotionally satisfactory? Help their pursuit of happiness? – I can’t disagree with that, Sophie. But isn’t there a difference between ‘respecting’ someone’s feelings, and accepting them sight unseen as a reason for rejecting or accepting a public decision? So if we accept that emotions should play a role even in large-scale public decisions: what role should they play? – You mean, other than just being brought up in the discussion and examined? – In other words, it seems you are staying within the assumption that there is, or should be, a discussion. A discourse. And that it consists of questions, issues, and — among other things: arguments? Or do you think you can keep people from arguing in discussions? – I see, Bog-Hubert. Yes, we are still talking argumentative model. Or what other models are such critics proposing to use as the basis for public planning? – Alternative models? To my knowledge, they tend to stay silent on that question. At least, I haven’t heard any alternative proposals in those situations. ‘It’s too rational’ or ‘It doesn’t acknowledge emotions’ — that’s usually the end of it. Of course there are a number of other approaches to problem solving and planning. But they don’t engage the issue of argumentation very well either. – Well Sophie, there is the whole realm of ‘Systems Thinking’ approaches — where the approach is to develop models and diagrams of the ‘whole’ system or problem situation, with all its factors and relationships. Very powerful and useful, if done right, in revealing the complexity of systems and their sometimes counter-intuitive behavior. – Think about it, Vodçek: there is hardly ever any talk about how they get all the information that goes into the models, (other than ‘research’, which may take the form of opinion, ‘user need’ or customer preference surveys or some such tools, usually to early on, to begin the model development work. Nor about how they resolve any disagreements about those assumptions. It simply isn’t talked about. In the finished model diagrams, it seems that all controversies and disagreements are assumed to have been settled. – True – I have been wondering about that myself. Which means that what the modeler- analysts have settled upon are their own perspectives or prejudices? – Don’t let them hear such heretical thoughts. To be fair, they are trying; and convinced that their data support those views. – Well. Let’s just keep the question unsettled for now. Any other approaches? Examples? – Sure. Just some examples: there are approaches like the ‘Pattern Language’, — you know that one? – Yes. Buildings, construction, urban design. In my opinion, that Pattern Language essentially aims at developing a collection of recipes or guidelines — ‘pattern’ sounds a little less than the rules they really are — that guarantee a good solution if they are applied properly, and therefore don’t need to be discussed or evaluated in any formal sense. No discussion or arguments there either. – So what role do feelings and emotions play in those approaches? – I guess the same accusation of not accommodating feelings could be raised against many systems models. ‘Stocks and flows’, variables and rates etc. don’t exactly sound like having to do with emotions. Nor does the statistical analysis of data – even when they deal with opinion surveys. Though the systems people would argue like Rittel does for the argumentative model, that if anybody wants to make a model of emotions and what influences those, say, they can do that in the systems vocabulary too. – And the pattern language? – And when the patterns are applied, there is no more talk about feelings or emotions, or arguments, pros or cons, either. – So I take it, we have the same problems with those approaches too? It seems we are back to discussion, discourse, argument, the minute we even begin to examine whether any alternative approach works, and how. So what do you think should be done with the argumentative discourse system you guys are working on, if you are going to stick with it? – Good question. That’s what I was cussing about. Do you have any suggestions for that problem? Vodçek? Sophie? – You are asking lil’ ol’ me? Let me think about it. Vodçek looks like he has thought some ideas: Do you, Vodçek? – Well, if I were bothered by the ‘argumentative’ label – which I’m not, mind you: in my experience around here, it makes people thirsty, you know what I mean? – but if I were, I’d start by changing that label. Isn’t your ‘planning discourse support system’ good enough? Well, it’s a bit long, and doesn’t make a catchy acronym; I’d work on that. And leave the reference to the argumentative model to the academic treatises. – Okay, that’s just the label, the name. Is that enough to change the reaction of those emotional advocates? – Maybe not. It might help if the discussion process could be started with some questions that de-emphasize the quarrelsome kind of argument part of the discussion. Starting up with questions about what folks would like to see in the solution or intervention to a problem situation: what would please other groups affected by the situation or potential solutions? What would make them feel good? – So as to make them focus on things they can agree on right from the start, instead of bickering about proposals they don’t like? Okay: how would you frame that? And how would you keep people from starting out on – of falling into — an adversarial track right from the start? For example, if somebody starts out with some pet proposal of a solution that raises the hackles of everybody else? – It might take some procedural manipulation, eh? – Bad idea, if you ask me. Wouldn’t that really aggravate people and get them upset? – All right. Suppose we start out by agreeing on some sequence beforehand – before any specific proposals are presented, and simply asked what such a proposal would or should look like if it were to make everybody happy? And agree that any ‘preconceived’ solutions be held back until they have been amended and modified with any suggestions brought up in that first phase of discussion? – I don’t think that any restrictions should be placed on the order or sequence in which people contribute their ideas to the discourse. So whatever is being brought in will have to be accepted and recorded as it comes in. I am assuming a system that is being run not in a meeting, but mainly on some platform with contributions in different media. All entries should be kept as they have been stated, in what we called the ‘Verbatim’ file. But your suggestion could be useful when the material is sorted out and presented in the files and especially maps, structured according to topics and questions or issues. This could be shown in a sequence that encouraged constructive ideas, a gradual building up of solutions towards results that are acceptable to everybody, rather than having a proposal plunked down initially, take-it-or leave-it style, that people have to argue about. – Sounds like something you should try out. – Would it help if during that phase, the display of ideas and comments could be kept ‘anonymous’? – Well, I have noticed that often, arguments get nasty not because the proposals are bad or controversial, but because of who made them. Jealousy, revenge for past slights, not wanting to give the other guy credit for an idea, or partisanship: ‘anything those guys are proposing we’ll turn down’ – you’ve seen those things, haven’t you? – Yes, the news media are full of them. – You don’t seem too excited about that idea. I think it gets in the way of the other provisions of your system – the evaluation part, does it? But you can still run that system of merit points ‘behind the curtain’ of the system, can’t you, so that people don’t evaluate ideas because of who proposed them? – I guess so. It might actually help the concern somebody mentioned, that the evaluation of contributions could be deliberately skewed because of such personal or partisanship jealousies. Yes, ideas might be rewarded more fairly for their own merit if you don’t know whose they are. – We’ll see. Sometimes the ideas are so obviously partisan that everybody can guess whose they are. – Well, back to the issue here: what about feelings and emotions? So far, what you have suggested is aimed more at defusing or minimizing extraneous feelings about other participants than about the problem and solution proposals? – Are you suggesting a rule about how participants should be wording their comments? What if they don’t? – No, that’s not what I’m saying. The original ‘verbatim’ record entries are worded in whatever way they choose. I’m talking about how they would be displayed in the maps. But of course, that very feature may lead people to formulate their comments in this way, both less ‘argumentative’ and less personal – as you suggested earlier, in a way that indicates a more common feeling than a purely individual one. – Hey, this all sounds very nice and friendly and cooperative. Well-intentioned. But are we looking at this in the right way? I mean, can all feelings, all emotions be treated the same way? Aren’t some more, let’s say, more ‘legitimate’ than others? – Good question. What are all the feelings those do-gooders want the system to accommodate’? – I think the judgment about whether they are legitimate or not must be left to the people participating in the discussion, don’t you agree? And it may be very different for different cases and situations? But yes, it may be useful to look at various kinds of emotions, to see whether they require different rules. Yeah, yeah: ‘nudges’, I see you’re frowning at the term ‘rule’, Sophie. Is there a rule against it? – Can we go with ‘encouragements’ for the time being? – We may have to ask some of the people raising this concern about feelings in the discourse, what kinds of feelings they have in mind. For example: I see many papers and blogposts complaining about other people’s resistance to change. Is that an issue we should look into? – Ah, the current obsession with change. I suspect that’s often just a fad, something all the management consultants have to promote so they can help management push for their particular brand of change in their organizations. The Starbucks syndrome: try to order a straightforward coffee these days – bad boy: You aren’t honoring the change, effort of innovation and increase in choices. As if you couldn’t just mix them up yourself to your own taste if they put out the ingredients. No: You’d get upset – there’s an emotion for you – if the recipe for your plain coffee were changed. – Hey, calm down, Sophie. Here’s a plain coffee for you. Sumatra. Cream? Sugar? Lemon? Red pepper? Brandy? French? Spanish? For recipes that aren’t on the Starbucks menu yet? But you are right, Bog-Hubert: Resistance to change is a common reaction. And it can be caused by many different emotions. Fear? Irritation over the reduced degree of certainty about the stability of conditions for your own plans? After all, your plans for whatever change or success you pursue are based on some context conditions being predictable and constant, so if those conditions change, you have to hustle and change your plans. Aggravations galore, right? Jealousy? Because the change will reduce your income while increasing that of the ‘change agent’ and other people? – This all sounds very negative, guys. Aren’t there positive emotions too, that might play a role? Excitement, a sense of adventure, even risk and danger: some people like and thrive on things that elevate their adrenaline levels? Hope? Empathy? Love? – Hold on, Sophie. You are right, we should consider positive emotions – but isn’t this getting into a whole range of different topics? Attitudes, values, beliefs, habits, personality likes and dislikes? Social pressures and demands. Boredom, curiosity, pride, group affinity and allegiances. Why should a planning discourse platform make special provisions for all of those? Can’t it be left to the people doing the planning in each specific case how they want to deal with such issues? – I think you are right. But the problem is still that the folks who need to run such discussions or to participate in them don’t see how that is possible in the current version of the approach, the way it is presented. It may boil down to getting the story across, perhaps finding better ways of making people familiar and comfortable with this way of thinking. – I see where you are headed, Vodçek. Games, am I right? – Yes. And good examples, stories. But yes, I think games are a good way to familiarize people with new ideas and ways to work together. You remember the weird experiment we did here some time ago – on the bus system issue? I think things like that would help. We should look at that issue again, see if we can develop some different versions, — some simple ones, for kids, and some more advanced ones that can actually be used as entertainment versions of planning and problem-solving tools for real cases. And the issue of how to deal with emotions in those might take the form of trying to make them exciting and fun to play. – Sounds like a plan… just don’t mention the word ‘argument’? – Yes. And whenever it does slip into the discussion and people object to it, ask them what other approach they suggest, for developing a better tool? Perhaps they might actually come up with some useful ideas? – Don’t get your hopes up. They’ll just vote you down. – Three cheers for the optimist. Yes, I say give them a chance to make some positive and practical contributions. We might learn something. Let’s go to work on it. • The question of argument reconstruction. • The question of representation of qualifiers in evaluation forms. 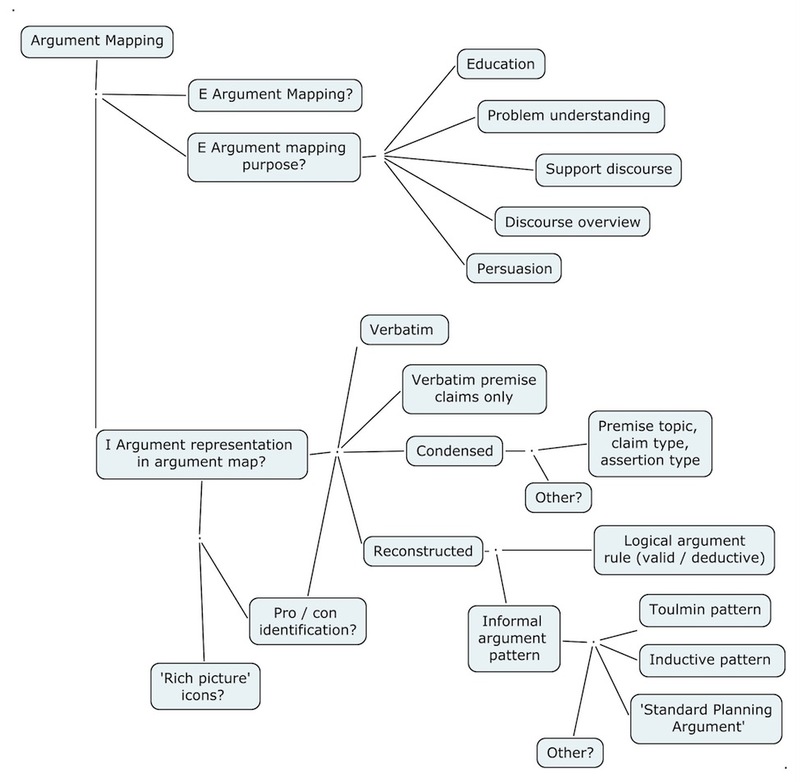 In previous work on the structure and evaluation of ‘planning arguments’ within the overall framework of the ‘Argumentative Model of Planning’ (as proposed by Rittel), I have been making various assumptions with regard to these questions — assumptions differing from those made in other studies and proposed discourse support tools. Such assumptions, for example regarding the conceptual framework, as manifested in the choice of vocabulary, — adopted as a mostly unquestioned matter of course in my proposals as well as in other’s work, — have significant implications on the development of such discourse support tools. They therefore should be raised as explicit issues for discussion and re-examination. A first step in such a re-examination might begin with an attempt to explicitly state my current position, for discussion. This position is the result, to date, of experience with my own ideas as well as the study of others’ proposals. Not all of the issues listed above will be addressed in the following. Some position items still are, in my mind, more ‘questions’ than firm convictions, but I will try to state them as ‘provocatively’ as possible, for discussion and questioning. 1 The development of a global support framework for the discussion of global planning and policy agreements, based on wide participation and assessment of concerns, is a matter of increasingly critical concern; it should be pursued with high priority. While no such system can be expected to achieve definitive universal validity and acceptance, and therefore many different efforts for further development of alternative approaches should be encouraged, there is a clear need for some global agreements and decisions that must be based on wide participation as well as thorough evaluation of concerns and information (evidence). The design of a global framework will not be structurally different from the design of such systems for smaller entities, e.g. local governments. The differences would be mainly ones of scale. Therefore, experimental systems can be developed and tested at smaller scales to gain sufficient experience before engaging in the investments that will be needed for a global framework. By the same token, global systems for initially very narrow topics would serve the same purpose of incremental development and implementation. 2 The design of such a framework must be based on — and accommodate — currently familiar and comfortable habits and practices of collective discussion. While there are analytical techniques and tools with plausible claims of greater effectiveness, ability to deal with the amount and complexity of data etc., the use of these tools in discourse situations with wide participation of people of different educational achievement levels would either be prohibitive of wide participation, or require implausibly massive information/education programs for which precisely the needed tools for reaching agreement on the selection of method / approach (among the many competing candidates) are currently not available. 3 Even with the growing use of new information technology tools, the currently most familiar and comfortable discourse pattern seems to be that of the traditional ‘linear discussion’ (sequential exchange of questions and answers or arguments) — the pattern that has been developed in e.g. the parliamentary tradition, the agreement of giving all parties a chance to speak, air their concerns, their pros and cons to proposed collective actions, before making a decision. This form of discourse, originally based on the sequential exchange of verbal contributions, is of course complemented and represented by written documents, reports, books, and communications. 4 A first significant attempt to enhance the ‘parliamentary’ tradition with systematic information system, procedural and technology support was Rittel’s ‘Argumentative Model of Planning’. It is still a main candidate for the common framework. Rittel’s main argument for the general acceptance of this model was the insight that its basic, general conceptual framework of ‘questions’, ‘issues’ (controversial questions), ‘answers’, and ‘arguments’ could in principle accommodate the content of any other framework or approach, and thus become a bridge or common forum for planning at all levels. This still seems to be a valid claim not matched by any other theoretical approach. The main options are to only refer to ‘questions’ and ‘responses’ and ‘claims’, and to avoid ‘argument’ as well as the concepts of ‘pro’s and ‘cons’ — arguments in favor and opposed to plan proposals or other propositions. Argumentation can be seen as the mutually cooperative (positive) effort of discussion participants to point out premises that support their positions, but that also are already believed to true or plausible by the ‘opponent‘, (or will be accepted by the opponent upon presentation of evidence or further arguments). But the more common, apparently persistent view is that of argumentation as a ‘nasty’, adversarial, combative ‘win-lose’ endeavor. While undoubtedly discourse by ay other label will produce arguments, pros and cons etc., the question is whether these should be represented as such in support tools, or in a more neutral vocabulary. Experiments should be carried out with representations of discourse contributions — in overview maps and evaluation forms — as ‘questions’ and ‘answers’. 6 Any re-formatting, reconstruction, condensing of discussion contributions carries the danger of changing the meaning of an entry as intended by its author. 7 The framework should provide for translation services not only for translation between natural languages, but also from specialized discipline ‘jargon’ entries to natural language. 8 While researchers in several disciplines are carrying out significant and useful efforts towards the development of discourse support tools, and some of these efforts seem to claim to produce universally applicable tools, such claims are overly optimistic. – ‘Forward-looking’ criteria: Expected result performance, Benefit-Cost Ratio, simulated performance of selected variables over time, or stability of the system, etc. It should be clear that the framework must accommodate all these approaches, or preferably, be based on an approach that could integrate all these perspectives, as applicable to context and characteristics of the problem. There is, to my knowledge, currently no approach matching this expectation, though some are claiming to do so (e.g. ‘Multi-level Systems Analysis’, which however is looking at only approaches deemed to fit within the realm of ‘Systems Thinking). 10 While the basic components of the overall framework should be as few, general, and simple as possible, — for example ‘topic’, ‘question’ and ‘claim’ or ‘response’, — actual contributions in real discussions can be lengthy and complex, and must be accommodated as such (in ‘verbatim’ reference files). However, for the purposes of overview by means of visual relationship mapping, or systematic evaluation, some form of condensed formatting or formalization will be necessary. The needed provisions for overview mapping and evaluation are slightly different, but should be as similar as possible for the sake of simplicity. a. Different detail levels of discourse maps should be distinguished: ‘Topic maps’, ‘Issue maps’ (or ‘question maps’), and ‘argument maps’ or ‘reasoning maps’. – Topic maps merely show the general topics or concepts and their relationship as linked by discussion entries. Topics are conceptually linked (simple line) if they are connected by a relationship claim in a discussion entry. – Issue or question maps show the relationships between specific questions raised about topics. Questions can be identified by type: e.g. factual, deontic, explanatory, instrumental questions. There are two main kinds of relationships: one is the ‘topic family’ relation (all questions raised about a specific topic); the other is the relationship of a question (a ‘successor’ question) having been raised as a result of challenging or query for clarification of an element (premise) of another (‘predecessor‘) question. – Argument or reasoning maps show the individual claims (premises) making up an answer or argument about an issue (question), and the questions or issues having been raised as a result of questioning any such element (e.g. challenging or clarifying, calling for additional support for an argument premise. b. Reasoning maps (argument maps) should show all the claims making up an argument, including claims left not expressed in the original ‘verbatim’ entry as assumed to be ‘taken for granted’ and understood by the audience. Reasoning maps aiming at encouraging critical examination and thinking about a controversial subject might show ‘potential’ questions (for example the entire ‘family of issues for a topic) that could or should be raised about an answer or argument. These might be shown in gray or faint shades, or a different color from actually raised questions. The reason is that other participants might disagree with one or several of the premises of an intended ‘pro’ argument, in which case the set of premises (not with the respective participant’s negation) can constitute a ‘con’ argument — but the map showing it as ‘pro’ would in fact be ‘taking sides’ in the assessment. This would violate the principle of the map serving as a neutral, ‘impartial’ support tool. d. For the same reason, reasoning maps should not attempt to identify and state the reasoning pattern (e.g. ‘modus ponens’ or modus tollens’ etc.) of the argument. Nor should they ‘reconstruct’ arguments into such (presumably more ‘logical’, even ‘deductively valid’) forms. Again, if in a participant’s opinion, one of the premises of such an argument should be negated, the pattern (reasoning rule) of the set of claims will become a different one. Showing the pattern as the originally intended one by the author, (however justified by its inherent nature and validity of premises it may seem to map preparers), the map would inadvertently or deliberately be ‘taking sides’ in the assessment of the argument. e. Topic, issue and reasoning maps should link to the respective elements in the verbatim and any formalized records of the discussion, including to source documents, and illustrations (pictures, diagrams, tables). d. The ‘rich image’ fashion (fad?) of adding icons and symbols (thumbs up or down, plus or minus signs) or other decorative features to the maps — moving bubbles, background imagery, etc. serve as distracting elements more than as well-intended user-friendly devices, and should be avoided. 12 Current discourse-based decision approaches exhibit a significant shortcoming in that there is no clear, transparent, visible link between the ‘merit’ of discussion contributions and the decision. Voting blatantly permits disregarding discussion results entirely. Other approaches (e.g. Benefit-Cost Analysis, or systems modeling) claim to address all concerns voiced e.g. in preparatory surveys, but disregard any differences of opinion about the assumptions entering the analysis. (For example: some entities in society would consider the ‘cost’ of government project expenditures as ‘benefits’ if they lead to profits for those entities (e.g. industries) from government contracts). The proposed expansion of the Argumentative Model with Argument Evaluation (TM 2010) provides an explicit link between the merit of arguments (as evaluated by discourse participants) and the decision, in the form of measures of plan proposal plausibility. This approach should be integrated into an approach dropping the ‘argumentative‘ label, even though it requires explicit or implicit evaluation of argument premises. In discussion-based planning processes, three main evaluation tasks should be distinguished: the comparative assessment of the merit of alternative plan proposals (if more than one); the evaluation of one plan proposal or proposition, as a function of the merit of arguments; and the evaluation of the merit of single contributions, (item of information, arguments) to the discussion. For all three, the basic principle is that evaluation judgments must be understood as subjective judgments, by individual participants, about the quality, plausibility, goodness, validity desirability etc. While traditional assessments e.g. of truth of argument premises and conclusions were aiming at absolute, objective truth, the practical working assumption here is that while we all strive for such knowledge, we must acknowledge that we do not have any more than (utterly subjective) estimate judgments of it, and it is on the strength of those estimates we have to make our decisions. The discussion is a collective effort to share and hopefully improve the basis of those judgments. The first task above is often approached by means of a ‘formal evaluation’ procedure developing ‘goodness’ or performance judgments about the quality of the plan alternatives, resulting on an overall judgment score as a function of partial judgments about the plans’ performance with respect to various aspects. sub-aspects etc. Such procedures are well documented; the discourse may be the source of the aspects, but more often, the aspects are assembled (by experts) by a different procedure. The following suggestions are exploring the approach of developing a plausibility score for a plan proposal based on the plausibility and weight assessments of the (pro and con) arguments and argument premises. (following TM 2010 with some adaptations). All elements to be ‘evaluated’ are assessed with the common criterion of ‘plausibility’, on an agreed-upon scale of +n (‘completely plausible’) to -n (‘completely implausible’), the midpoint score of zero meaning ‘don’t know’ or ‘neither plausible nor implausible’. While many argument assessment approaches aim at establishing the (binary) truth or falsity of claims, ‘truth’, (not even ‘degree of certainty’ or probability about the truth of a claim), does not properly apply to deontic (ought-) claims and desirability of goals etc. The plausibility criterion or judgment type applies to all types of claims, factual, deontic, explanatory etc. Deontic claims (goals, objectives) are not equally important to people. 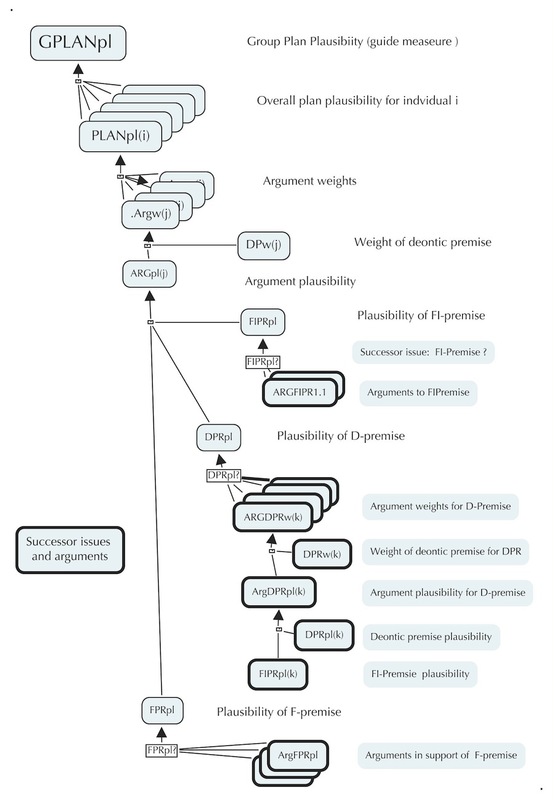 To express these differences in importance, individuals assign ‘weight of relative importance) judgments to deontics in the arguments, on an agreed upon scale of zero to 1 such that all weights relative to an overall judgment add up to 1.
c. All premises of an argument are assigned premise plausibility judgments ppl; the deontic premises are also assigned their weight of relative importance pw. d. The argument plausibility argpl of an argument is a function of the plausibility values of all its premises. e. Argument weight argw is a function of argument plausibility argpl and the weight ppw of its deontic premise. 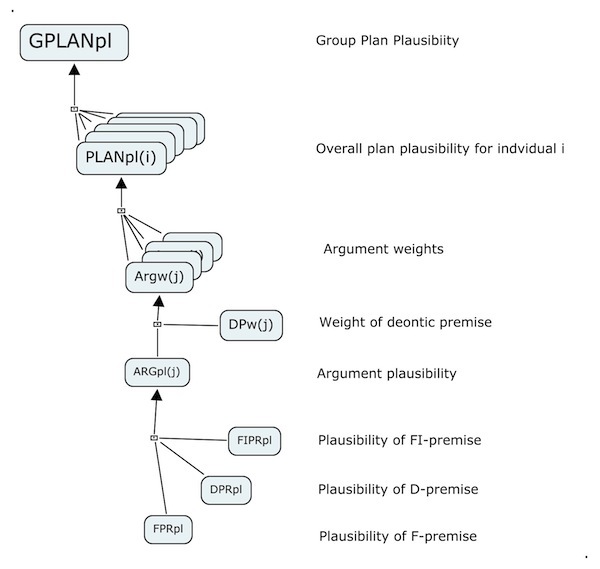 f. Individual Plan or Proposal plausibility PLANpl is a function of all argument weights. g. ‘Group’ assessments or indicators of plan plausibility GPLANpl can be expressed as some function of all individual PLANpl scores. However, ‘group scores’ should only be used as a decision guide, together with added consideration of degrees of disagreement (range, variance), not as a direct decision criterion. The decision may have to be taken by traditional means e.g. voting. But the correspondence or difference between deliberated plausibility scores and the final vote adds an ‘accountability’ provision: a participant having assigned a deliberated positive plausbility score for a plan but voting against it will face strong demands for explanation. h. A potential ‘by-product’ of such an evaluation component of a collective deliberation process is the possibility of rewarding participants for discussion contributions not only with reward points for making contributions — and making such contributions speedily, (since only the ‘first’ argument making the same point will be included in the evaluation) — but modifying these contribution points with the collective assessments of their plausibility. Thus, participants will have an incentive — and be rewarded for — making plausible and meritorious contributions. 14 The process for deliberative planning discourse with evaluation of arguments and other discourse contributions will be somewhat different from current forms of participatory planning, especially if much or all of it is to be carried out online. The main provisions for the design of the process pose no great problems, and small experimental projects can be carried out with current tools ‘by hand’ with human facilitators and support staff using currently available software packages. But for larger applications adequate integrated software tools will first have to be developed. 15 The development of ‘civic merit accounts’ based on the evaluated contributions to public deliberation projects may help the problem of citizen reluctance (often referred to as the problem of ‘voter apathy’) to participate in such discourse. However, such rewards will only be effective incentives if they can become a fungible ‘currency’ for other exchanges in society. One possibility is to use the built-up account of such ‘civic merit points’ as one part of qualification for public office — positions of power to make decisions that do not need or cannot wait for lengthy public deliberation. At the same time, the legitimization for power decisions must be ‘paid for’ with appropriate sums of credit points — a much-needed additional form of control of power. 16 An important, yet unresolved ‘open question’ is the role of complex ‘systems modeling’ information in any form of argumentative planning discourse with the kind of evaluation sketched above. 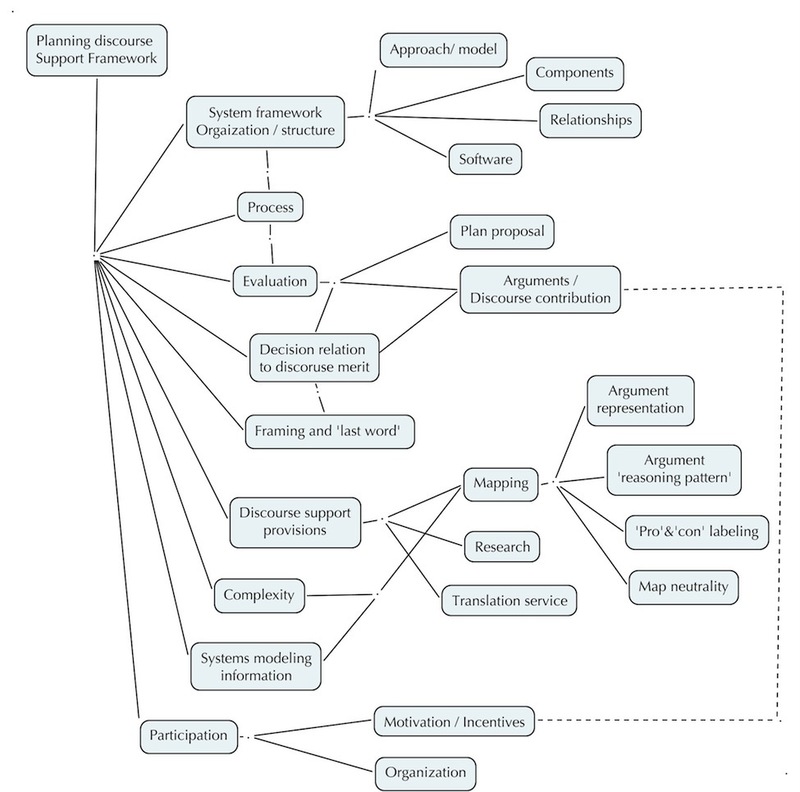 Just as disagreement and argumentation about model assumptions are currently not adequately accommodated in systems models, the information of complex systems models and e.g. simulation results is difficult to present in coherent form in traditional arguments, and almost impossible to represent in argument maps and evaluation tools. Since systems models arguably are currently the most important available tools for detailed and systematic analysis and understanding of problems and system behavior, the integration of these tools in the discourse framework for wide public participation must be seen as a task of urgent and high priority. 17 Another unresolved question regarding argument evaluation (and perhaps also mapping) is the role of statement qualifiers. Whether arguments that are stated with qualifiers (‘possibly’, ‘perhaps’; ‘tend to’ etc.) in the original ‘verbatim’ version should show such qualifiers in the statements (premises) to be evaluated. Arguably, qualifiers can be seen as statements about how an unqualified, categorical claim should be evaluated; the proponent of a claim qualified with a ‘possible’ does not ask for a complete 100% plausibility score. This means that the qualifier belongs to a separate argument about how the main categorical claim should be assessed, and thus should not be included in the ‘first-level’ argument to be evaluated. The problem is that the qualified claim can be evaluated — as qualified — as quite, even 100% plausible — but that plausibility can (in the aggregation function) be counted as 100% for the unqualified claim. Unless the author can be persuaded to add an actual suggested plausibility value in lieu of the verbal qualifier, one that other evaluators can view and perhaps modify according to their own judgment (unlikely and probably impractical), it would seem better to just enter unqualified claims in the evaluation forms, even though this may be seen as misrepresenting the author’s real intended meaning. 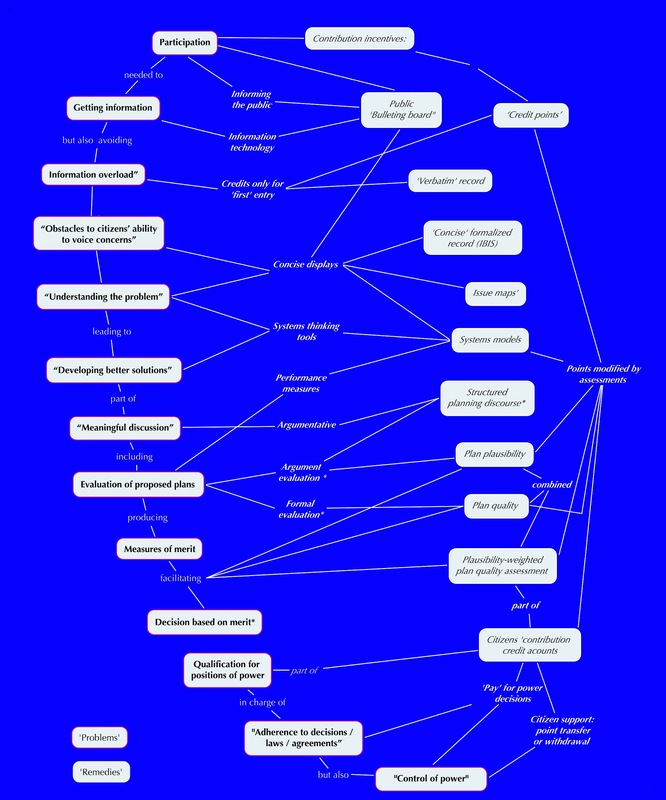 18 Examples of topic, issue, and argument maps according to the preceding suggestions. 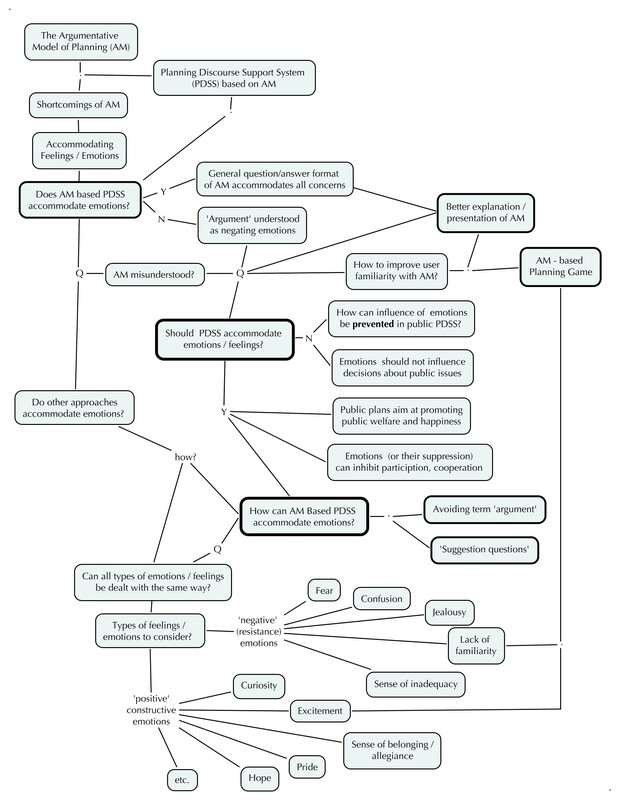 c. A map of the ‘first level’ arguments in a planning discourse: the overall plan plausibility as a function of plausibility and weight assessments of the planning arguments (pro and con) that were raised about the plan. d. The preceding diagram with ‘successor’ issues and respective arguments added. 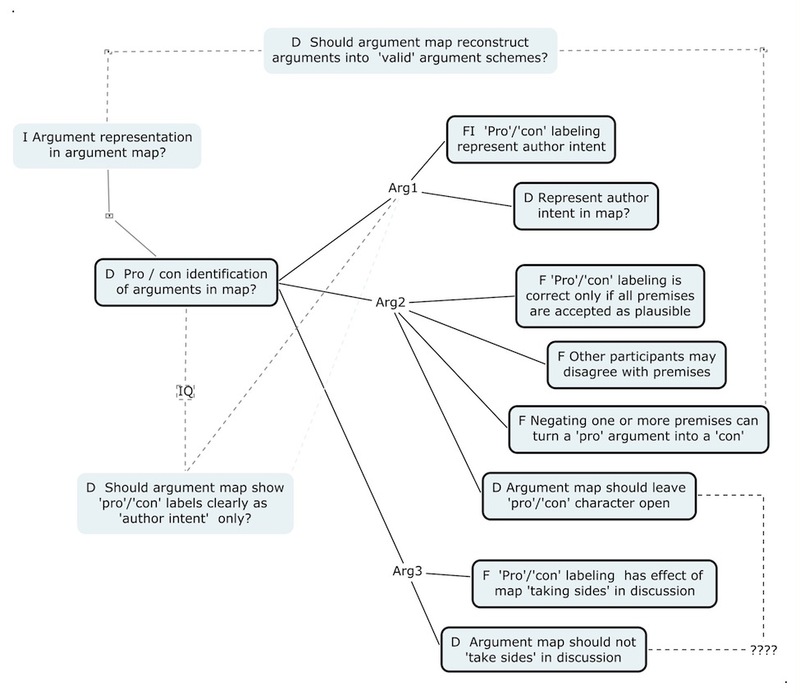 Argument map for mapping issue ‘Should argument map show ‘pro’ and ‘con’ labels? Mann, T. (2010) “The Structure and Evaluation of Planning Arguments” Informal Logic, Dec. 2010. Rittel, H. (1972) “On the Planning Crisis: Systems Analysis of the ‘First and Second Generations’.” BedriftsØkonomen. #8, 1972. – (1977) “Structure and Usefulness of Planning Information Systems”, Working Paper S-77-8, Institut für Grundlagen der Planung, Universität Stuttgart. – (1980) “APIS: A Concept for an Argumentative Planning Information System’. Working Paper No. 324. Berkeley: Institute of Urban and Regional Development, University of California. – (1989) “Issue-Based Information Systems for Design”. Working Paper No. 492. Berkeley: Institute of Urban and Regional Development, University of California. Suggestions made by proponents of ‘systems thinking’ or systems analysis to discussions we might call ‘planning or policy discourse’ often take the form of recommendations to construct models of the ‘whole system’ in question, and to use these to guide policy decisions. A crude explanation of what such system models are and how they are used might be the following: The ‘model’ is represented as a network of all the parts (variables, components; e.g. ‘stocks’) in the ‘whole’ system. What counts as the whole system is the number of such parts that have some significant relationship (for example, ‘flows’) to one another — such that changes in the state or properties of some part will produce changes in other parts. Of particular interest to system model builders are the ‘loops’ of positive or negative ‘feedback’ in the system — such that changes in part A will produce changes in part B, but those changes will, after a small or large circle of further changes, come back to influence A. Over time, these changes will produce behaviors of the system that would be impossible to track with simple assumptions e.g. about causal relationships between individual pairs of variables such as A and B. – the magnitudes (values) of the initial system variables, e.g. stocks. System models are presented as ‘decision-making tools’ that allow the examination of the effects of various possible interventions in the system (that is, introduction of changes in systems variables that can be influenced by human decision-makers) given various combinations of conditions in variables that cannot be influenced but must be predicted, as well as assumptions about the strength of interactions. All in order to achieve certain desirable states or system behaviors (the ‘goals’ or objectives measures by performance criteria of the system). System modelers usually refrain from positing goals but either assume them as ‘given’ by assumed social consensus or directives by authorities who are funding the study (a habit having come in for considerable criticism) or leaving it up to decision-maker ‘users’ of the system to define the goals, and use the simulations to experiment with different action variables until the desired results are achieved. Demonstrations of the usefulness or reliability of a model rest on simulation runs for past system states (for which the data about context and past action conditions can be determined): the model is deemed reliable and valid if it can produce results that match observable ‘current’ conditions. If the needed data for this can be produced and the relationships can be adjusted with sufficient accuracy to actually produce matching outcomes, the degree of confidence we are invited to invest in such models can be quite high: very close to 100% (with qualifications such as ‘a few percentage point plus or minus’. While ‘conditions C’ are mostly thought of as simple, one-variable phenomena, the systems thinker will recognize that ‘conditions C’ should include all the assumptions about the state of the whole system in which action X is one variable that can indeed be manipulated by decision-makers (while many others are context conditions that cannot be influenced). So from this point of view, the argument should be modified to include the entire set of assumptions of the whole system. The question of how a meaningful discourse should be organized to take this expectation into account while still accommodating participation by citizens — non-experts — is a challenge that has yet to be recognized and taken on. Meanwhile, however, the efforts to improve the planning discourse consisting of the simpler pro and con arguments might shed some interesting lights on the issue of the reliability of system models for predicting outcomes of proposed plans over time. The improvements of the planning discourse in question have to do with the proposals I have made for a more systematic and transparent assessment of the planning argument — in response to the common claim of having public interest decisions made ‘on the merit of arguments’. The approach I developed implies that the plausibility of a planning argument of the types 1,2,3 above (in the mind of an individual evaluator) will be a function of the plausibility of all the premises. I am using the term ‘plausibility’ to apply both to the ‘factual’ premises claiming the relationship X –>Y and the presence of conditions C (which traditionally are represented as ‘probability’ or degree of confidence) as well as the to the deontic premise ‘Y ought to be aimed for’ that is not adequately characterized by ‘probability’ much less ‘truth’ or ‘falsity’ that is the stuff of traditional argument assessment. The scale on which such plausibility assessment is expressed must be one ranging from an agreed-upon value such as -1 (meaning ‘totally implausible) to +1 (meaning totally plausible, entirely certain) with a midpoint of zero (meaning ‘don’t know’; ‘can’t tell’ or even ‘don’t care’). This means that the argument plausibility will decrease quite rapidly as the plausibilities for each of these premises deviate from 100% certainty. Experiments with a plausibility function that consists of the simple product of those plausibilities have shown that the resulting overall argument plausibility often shrinks to a value much closer to zero that to +1; and the overall proposal plausibility (e.g. a sum of all the weighted argument plausibilities) will also be far away from the comfortable certainty (decisively ‘pro’ or decisively ‘con’) hoped for by many decision-makers. These points will require some further study and discussion in the proposed approach to systematic argument assessment. For the moment, the implication of this effect of argument plausibility tending towards zero on the issue of enhancing arguments with the proper recognition of ‘all’ the system condition assumptions of the ‘whole’ system deserve some comment. For even when a model can be claimed to represent past system behavior with reasonable degree of certainty plausibility close to 1, the projection of those assumptions into the future must always be done with a prudent dose of qualification: all predictions are only more or less probable (plausible), none are 100% certain. The deontic premises as well are less than totally plausible — indeed usually express legitimate opposing claims by people affected in different ways by a proposed plan, differences we are asked to acknowledge and consider instead of insisting that ‘our’ interests are to be pursued with total certainty. We might even be quite mistaken about what we ask for… So when the argument plausibility function must include the uncertainty-laden plausibility assessments of all the assumptions about relationships and variable values over time in the future, the results (with the functions used thus far, for which there are plausible justification but which are admittedly still up for discussion) must be expected to decline towards zero even faster than for the simple arguments examined in previous studies. So as the systems views of the problem situation becomes more detailed, holistic, and sophisticated, the degree of confidence in our plan proposals that we can derive from arguments including those whole system insights is likely getting lower, not higher. This nudge towards humility even about the degree of confidence we might derive from honest, careful and systematic argument assessment may be a disappointment to leaders whose success in leading depends to some extent on such degree of confidence. Then again, this may not be a bad thing.